5000 passengers and 200+ crew are in suspended animation on a 120 year long journey to a new planet and a new life. 30 years after leaving Earth the spaceship ran into a meteor which damaged the computers and structure. Although the fail-safe mechanisms saved the ship, a single pod failed and the occupant woke up. 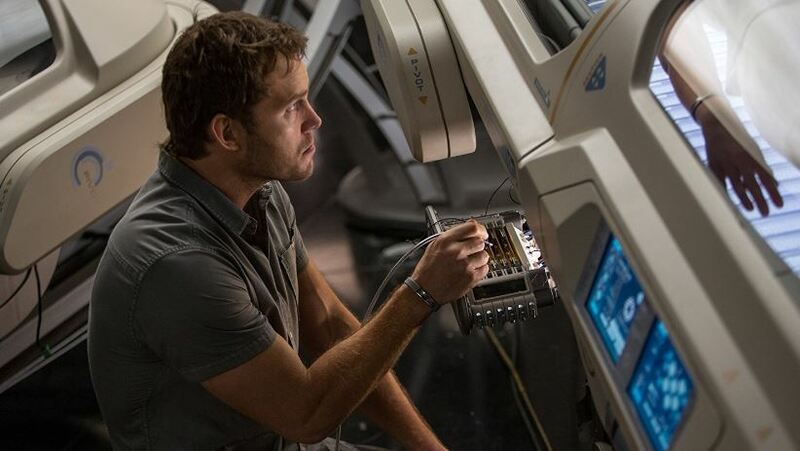 Mechanical engineer, Jim Preston (Chris Pratt) soon found out that he was the only human awake and that they still had 90 years to go in their journey. Oooops. With only the android bartender, Arthur (Michael Sheen), to talk to, Jim spends a little over a year freaking out. One day, after taking a recreational space walk……he decides to kill himself. Walking thru the passenger pods one last time, he spots Aurora Lane (Jennifer Lawrence) peacefully sleeping. Jim accessed Aurora’s personal file and decided he would really enjoy her company for the rest of his life. After months of struggling with the option of waking her up or not, he finally did…..
“Passengers” is an interesting sci-fi adventure. The first hour is only Chris Pratt and Michael Sheen while Jennifer Lawrence appears only in the second half of the movie (so what you see in the trailers is after the first hour). Not that this is bad, as it effectively shows the loneliness Jim is experiencing….but…..zzzzzzz. With Jennifer joining the crew…..the second hour sparkles.